Ernst's Economy for you: Children as guinea pigs in outrageous educational experiments: do the so-called Steve Jobs schools in The Netherlands lead to a new kind of illiteracy?! Children as guinea pigs in outrageous educational experiments: do the so-called Steve Jobs schools in The Netherlands lead to a new kind of illiteracy?! The extremely hazardous link between iPad technology and primary schools might yield a generation, which cannot write by hand at all. Very young children, handed over by their stupefied parents to technological nitwits and revolutionaries from outer space, could consequently fail to learn the most fundamental human skill there is. Apart from the creation of drawings and paintings on rock, which already happens for about 30,000 years, writing by hand is perhaps the oldest art and non-verbal expression form that humans master. The Sumerian and Elamite cuneiform script and the Egyptian hieroglyphics are all developed more than 3000 years before Christ and form the oldest written expressions in the world, known to man. After these early historical writings, which enabled for the first time the possibility to store and display thoughts, concepts and events in a structured manner, human writing has spread around the globe, where it evolved into dozens of very different writing systems. Look for instance to the totally different Far Eastern and Pan-Asian character sets, with their thousands of figurative characters, which all symbolize different words, symbols and expressions. Or look at the more stylized Arabic and Hebrew scripts, the well-known Latin character set or the very similar Greek and Cyrillic sets, which are respectively in use in Greece and a substantial part of the Balkan countries and the former Soviet states. If one particular human “invention” has delivered a hard to overrate contribution to the development of the human race, it must the development of writing. Suddenly people did not have to establish and maintain their history, gathered knowledge and investions exclusively from their own memories and oral conveyance anymore. They were able to store these in a way that could be understood by other people, litterally thousands of years later. This made history comprehensible and even tangible for other people and made it possible to people to store their own history in a chronological way, for their offspring and even hundreds of generations thereafter. The fact that we still know who Plato and Socrates were and what they meant for us modern people and the circumstance that we are still able to read the hieroglyphics from the time of Tutanchamon and the other Egyptian faraos, via the Stone of Rosetta, emphasizes the enormous importance of writing. Never could the Romans have reached their exceptional knowledge level without the invention of writing and the Enlightenment could not have sent such shockwaves through Europe, without writings in handwritten or printed form. Litterally the whole existence of modern humanity is established upon human writing in all its representations. Nevertheless there are in The Netherlands - and probably also in other countries - derailed, post-modern parents, who leave the upbringing of their youngest children to a group of technological nitwits and revolutionaries from outer space, with a totally messed up view on humanity. A few years ago these nitwits and revolutionaries, in their blind worshipping of their “idol” (i.e. false god) Steve Jobs, established the so-called Steve Jobs schools-with-the-iPad, in which pencils, pens, paper and the (digital) whiteboard all have been replaced by tablets for all pupils and teachers. One of these schools is in my domicile Almere in The Netherlands. And indeed, these children do learn to wrangle the latest digital and mobile technology at a very young age and without a doubt they will be able to find their way in the corporate world in later times. Or won’t they?! Ma’am “Xaviëra” [for reasons of privacy, this is not her real name – EL] is the teacher of my youngest son. She is an excellent, old-school teacher from Almere, with passion for her children and, besides that, a lot of perseverance, excellent theoretical knowledge and an enormous dose of goodwill. This wonderful teacher received a new, eight year-old girl in her class room, coming from such a ‘Steve Jobs’ iPad-school. 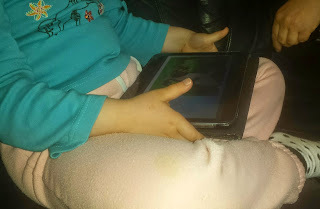 She was brought in by her parents, who had woken up from their technology infatuation and started to wonder whether this iPad school was indeed the best place for their kid or not?! According to Ma’am Xaviëra, she found out, after the acceptance of the kid on our school, that this eight year-old girl could not write at all with pencil or pen and paper. Where normal eight year-olds received about two to three years of writing lessons and in the meantime learned to write with their pens at a quite high level, this child was lagging by lightyears on her way to acquire the most fundamental human skill: writing. Fortunately Ma’am Xaviëra will look after it personally that this child will acquire ‘the mother of all skills’ at an accelerated level. This girl will soon be able to blend in with the rest of her class. That is the good news. The bad news is, however, that this particular kid was probably not an anomaly: a one-of-a-kind exception. Probably there were more children in her class, who couldn’t write using pen and paper. And perhaps the large majority of the children at these Steve Jobs schools can’t even write with pen and paper. Who will know?! This means, in other words, that these children have been sacrificed, as genuine guinea pigs, to the technology infatuation of their parents, as well as to the technological nitwits and revolutionaries from outer space, who established and populated these schools. Guinea pigs, for whom salvation might come too late in some cases, as learning such fundamental skills is much harder for older children and adolescents than for the youngest children, who learn this effortlessly while playing. In spite of the fact that these children can type and write on their computers and iPads, they are nevertheless illiterates in a certain way, as they don’t master the most important of human skills: writing by hand. How is it possible that in such a highly technological and technocrat country, with so many tight rules and regulations, as The Netherlands, such dangerous amateurs can do what they want at schools they established themselves; schools which seem to be established upon technological infatuation alone. And how is it possible that the Dutch educational inspection, which looks after some of the most ridiculous rules in the most thorough way, totally ignores these events at the iPad schools?! When I heard about the Steve Jobs iPad schools a few years ago, I was already afraid that such excesses would be the consequence, for the simple reason that these schools were established by “religious believers”, with neither a form of self-reflection nor an ability to put things in perspective. Now it is perhaps not too late yet to save these children and teach them this very important skill. For the very simple reason that we would never have heard about Socrates and Plato, when the classic, old Greeks would not have learned to write… with pen and papyrus!